Lawsuit threatens future of cattle at Point Reyes National Seashore—or does it? MOO WITH A VIEW The Drakes Bay oyster battle is over, but a confrontation over cattle is heating up at Point Reyes National Seashore. 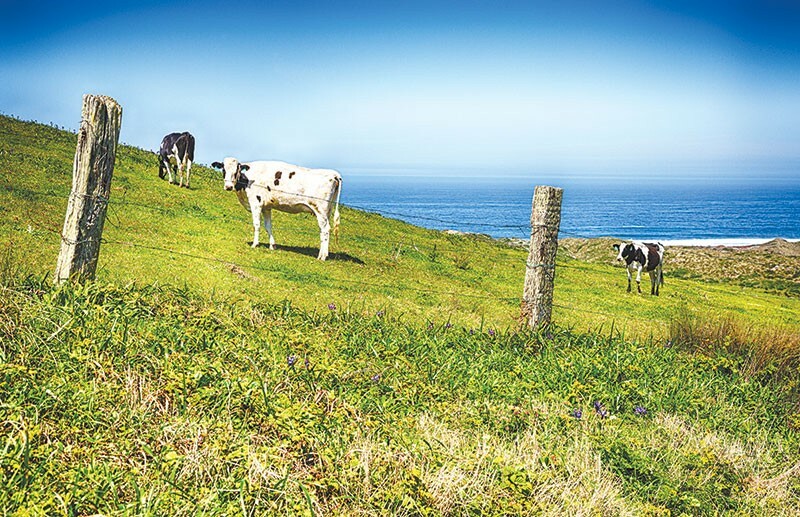 Litigants in the battle over the future of cattle grazing on the Point Reyes National Seashore will head to federal court later this spring. A lawsuit filed by a trio of environmental organizations in February is aimed at the National Park Service and Cicely Muldoon, superintendent of the park. Its stated purpose is to force the NPS to better manage the 18,000 acres of dairy and beef cattle that graze the park's pastoral zone, along with the not-so-occasional tule elk that wander into those lands, located in the southern end of the park. But the stakes are potentially higher. A successful outcome for the plaintiffs, says Huey D. Johnson of the Mill Valley–based Resource Renewal Institute, could impact other cattle operations, including ranches located within the Golden Gate National Recreation Area and beyond. "Sure. It will transfer over to the nation," says Johnson, a local titan of environmentalism and a former state resource secretary under Gov. Jerry Brown in the 1970s. His organization is joined in the suit by the Center for Biological Diversity and the Western Watersheds Project. "There are a number of national parks with cows," says Johnson, "and powerful special interests that promote grazing in federal landscapes." The suit calls on the National Park Service (NPS) to update its Point Reyes documents, especially the 1980 General Management Plan to include, for example, an environmental impact review of the ranches. The lawsuit claims, among other negative impacts, that the cattle cause erosion and manure impacts salmon downstream. Following hard on the hooves of a bad-blood lawsuit with the now-closed Drakes Bay Oyster Company, the latest Point Reyes lawsuit comes as the NPS is working on its Ranch Comprehensive Management Plan as part of its responsibilities under the National Environmental Policy Act. On that front, the lawsuit appears to demand the NPS do what it is already doing—come up with a plan for managing the ranchlands—with the kicker that there are still too many cows (about 4,000). The park's point-person on ranching issues, Melanie Gunn, couldn't comment on the pending litigation, but NPS officials have stated that the agency is determined to keep the ranchers in the park. While the battle to save Drakes Bay is over, those iconic "Save Drakes Bay" signs are still up all over the North Bay—as are signs along ranch fences around West Marin that call for more fencing in the park to keep the elk and cow herds separated. The oyster and cattle suits appear similar—commercial activity undertaken with ad hoc leases on public land—but the potential elimination of cattle ranching in Point Reyes is on a higher order of magnitude when it comes to the potential economic impacts. Ranching advocates highlight that the milk that flows from the Holsteins and Jerseys is some of the finest and that the ranches support numerous other jobs in the area—from truckers to veterinarians to graphic artists to the Marin Sun Farms restaurant and retail outpost on Highway 1 in Point Reyes Station. Marin Sun's ranch is located in the park. Johnson says he loves his beef and his ice cream, too, but that's not the point. The point, he says, is to enforce accountability on an agency that's mucked through its management of the cows (and the elks) for decades. Johnson says that opposition to the suit is coming from a "funny little cabal of dairy lovers out there. They've gotten well-rooted, the local press often favors them, they are nice people and it seems like a good idea. . . . I would say that there's been something of a public relations war, not really a war but an ongoing struggle, and a handful of well-meaning elderly environmentalists have long ago fallen in love with dairy cattle." But it's not just the green elders of Inverness who are supporting new leases for the ranchers; the West Marin Environmental Action Committee was a driving force behind the Drakes Bay lawsuit, but is not onboard with the current litigation. The former executive director, Amy Trainer, moved on in October, and the current director, Morgan Patton, says the organization is supporting a pledge made to ranchers to grant longer leases made by then–secretary of the interior Ken Salazar as the Drakes Bay battle waged. To ease the concerns of ranchers that they were next on the get-out list—including Kevin Lunny, who ran Drakes Bay and operates one of the cattle ranches in Point Reyes National Seashore—Salazar said he would work on securing 20-year leases for the ranchers. "We support the decision," says Patton of the Salazar pledge, in an interview at the Environmental Action Committee office in Point Reyes Station (which was vandalized during the Drakes Bay fight). The ranchers are now on ad hoc, year-to-year leases which can both foster financial insecurity and don't provide a whole lot of incentive to properly manage one's ranch. The organization, says Patton, is working with the park and ranchers on the management plan. Patton notes that a key difference between the respective suits was that Drakes Bay Oyster Company was operating in an area with a wilderness zoning designation; the cattle are all on land zoned as pastoral in the enabling legislation that gave rise to the Point Reyes National Seashore in 1962. In other words, the cattle occupy land that was originally zoned so that they could occupy it.